I’ve written up a pair of reviews for this series at videolamer, but I wanted to go into a little bit more about the atmosphere of Digital Devil Saga – because it is nearly perfect for a post-apocalyptic game (with no real-world tie in beyond vague references to global warming). I grabbed the soundtrack for this game, and while I don’t think it’s as good as Shoji Meguro’s work in the Persona series, it’s still pretty solid and brought this to mind. Digital Devil Saga is depressing, but each game is depressing in a different way. DDS1 deals with death to some degree, but the bulk of the sadness comes from the world rather than individual loss. The Junkyard is a sparse, desolate place where there is an endless rain. No sun shines upon it (even when, near the end, the rain actually stops). Even the clothes its denizens wear are gray, with only a single splash of color to indicate one’s clan. If things weren’t bland enough, even the pupils of the characters are gray (until certain events start occurring, indicating a resurgence of lost emotion – at which point, naturally, their pupils match their hair color). The colors aside, the landmarks in the junkyard evoke a similar feeling of desolation. Though the fortresses of each clan are impressive, they are not in themselves that interesting. More so are the various non-fortress places you wander; a beached battleship, with a giant rip in its side, a single standing building among several that were torn in half (serving as a temporary hideout), and finally what appears to be an ancient theme park attraction. Unfortunately, pictures of these areas are not really possible to find via google. In Digital Devil Saga 2, the focus becomes less on atmosphere (though it is still there) and more on individuals. The new character, Roland, is an old drunkard who is trying to forget a terrible event in his past. The old characters are much better fleshed out (aside from Cielo – who remains a comic-relief Jamaican guy throughout. Apparently there is dialogue that tells his past, but nobody cared enough to mention it in the main story line). Heat, in particular – who is the most expressive character in the first game – is really interesting. He has an incredible, bordering on unrealistic, aggressiveness that is suddenly explained all at once (along with the past of most of the characters). His friendship (?) with Serph becomes strained in most of the first game (he is constantly complaining that Serph is the leader, while he is clearly the strongest). It really becomes a focus in the second game to great effect. It turns DDS2 into a very human – albeit depressing – story. I picked up the PSP remake of Persona last week. Thus far I’ve found it to be mostly superior to the original, with some relatively minor negatives. The biggest positive is that the relatively low-quality and occasionally downright strange original localization has been replaced with a spiffy, high-quality and more accurate job. No longer does the game pretend to take place in the sleepy U.S. town of Lunarvale, and no longer does Guido Sardenia plot to do evil things to said sleepy town. The localization work in PPSP is overall great and, near as I can tell, accurate (aside from one small gaffe [/edit: Not actually a gaffe, the gaffe was mine; see comments]; apparently the “Hiremon Stone” is in St. Hermelin’s courtyard, rather than the Philemon Stone). The only negatives I’ve seen thus far have to do with sound effects. While I do miss the original voicing (remarkably good for the time) the new stuff is better. But the small pieces that formed a greater feel for the game – the sort-of-scifi sound effects, the Persona summon sound effect, even the surprised scream when you walk into a trapdoor – all are missing, usually simply silent. When the Deva System goes into overload, there’s no indication whatsoever. While it’s still worth picking up – I can’t help but think that it still lost something in the process of gaining a new subquest, improved translation and reworked soundtrack. One of the first RPGs to land on the Playstation in 1997 was an unassuming, Old West-inspired game by the name of Wild Arms. Though it never managed to compete with more mainstream series, it has a greatness all its own; with a solid difficulty balance, a variety of puzzles, and a plot that dwells more on loneliness and a decaying world than on long-haired villains or a large but irrelevant main cast, I consider it one of the best RPGs on the system. In the past couple weeks, the news got out that Akifumi Kaneko, the lead designer and scenario writer for the entire Wild Arms series, left Media.Vision in 2008. This came a couple years after Michiko Naruke, who had been the primary composer for the first four games, had stopped working on the series due to illness. Although it’s possible that we’ll see more Wild Arms games, these two were the heart of the series – any more we’d see would probably have a completely different feel (though the most recent two had already reached that point). In memory of the loss of the core of the series, I’d like to dwell a little on the best and most innovative elements of the first five games (and F). I exclude XF only because I’ve not yet played it (it’s on my to-do list). I’ll generally avoid major spoilers where I can. 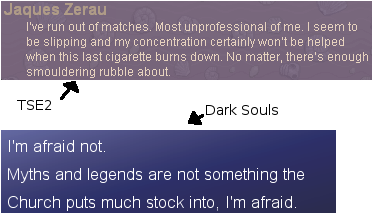 The following is a much-abridged review of Dark Souls; a fuller review can be had here. Dark Souls is an indie RPG, created in the much-maligned RPG maker. Aside from its oversized font (compare its font and The Spirit Engine 2’s), you wouldn’t be able to tell so easily; it runs quite fast and despite being locked into tiles, it looks good, feels natural, etc. Dark Souls has a pretty good plot, which offsets its soul-crushing difficulty (seriously; in some random battles, if you do not play optimally, you can die the first round). It’s dark, but not so dark as to be unbelievable. The main character has been there and done that – rather unusual, particularly since he maintains that attitude throughout – and between him and a pair of the other party members, there’s enough veteran to go around. The Wild Arms series has been largely unique among commercial games in that it usually has a 30+ character who acts as mentor and guardian to the group (FFX did similar with Auron); but TSE2 and Dark Souls joined that group and took the idea further; in the latter, Gauly takes center stage, complementing the traditional naive-priestess female lead.